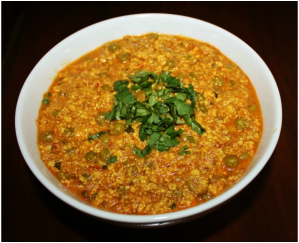 ﻿C﻿rumbled paneer curry is a wonderful spicy dish that can be served as an accompaniment to any Indian dinner. 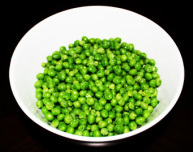 The combination of paneer and Mutter (green peas) is very popular in North India. 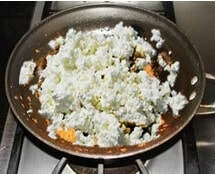 Paneer is an important part of North Indian cooking. There are so many wonderful dishes are prepared combining with paneer. Crumbled Paneer curry is a great tasty tempting side dish and very easy to make. the onions fry for 8 to 9 minutes, frequently stir the onions. quickly. Keep stirring the onion masala, turn the heat down to medium. the onion masala is done. 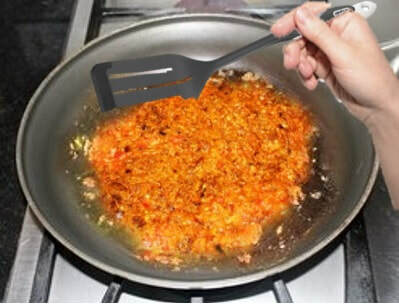 masala, cover the pan and cook on medium heat, keep starring periodically. for another 5 minutes, turn the stove off and garnish with coriander leaves. 12. Paneer curry should be thick in consistency.